Have you ever wondered what your ancestors looked like? Before the invention of photography in the 1830’s, there was only one way to remember a loved one – a formal portrait painted by an artist. If your family had enough money, they might commission an artist to capture your image for posterity. But this was an expense most families could not afford. More likely than not, ancestors living prior to the 1840s (when commercial photography was first introduced) left no images for future generations to ponder. I’ve spent many hours researching the details of the Genetti family – their names, spouses, children, birth dates and deaths. This information is all that we have to remember them by. Often I wonder just who they were, what kind of personalities they had, what did they do for a living, how did they dress and what did they look like. A few days ago, I was visiting an art museum in Sydney (yes I’m still in Australia). A small oil portrait by an Italian artist of the late Renaissance period caught my eye. The name plate on the work of art stopped me immediately. “Portrait of a Young Man” painted around 1565 by Giovanni Battista Moroni. 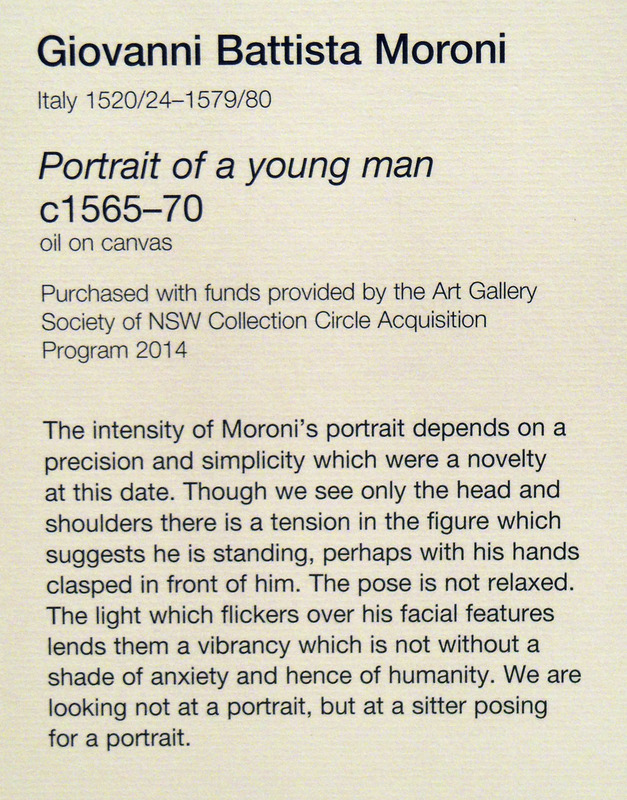 The artist’s name made me smile since there are many men on the Genetti family tree named “Giovanni Battista”. I snapped a photo of the painting and decided to do more research later on Master Moroni. That evening I googled the artist to find a pleasant surprise. He was considered one of the best portrait painters of his time. Giovanni was born and worked most of his life in a small Northern Italian city, not far from Castelfondo (the Genetti’s village of origin). He had also worked for a period of time in the city of Trent (Trento), located down the valley from Castelfondo. Giovanni Battista was of Northern Italian descent, as most likely, were his clients and sitters. Wow! The pensive young man in the painting with intense eyes, short-cropped hair and a ruffled collar probably represented the appearance and dress of men in the mid-1500’s. Which of my ancestors had been a contemporary of this era? After consulting the online family tree, I found Pietro Genetti, my 10th great-grandfather, had lived during this time. From clues left in parish records, we know that Pietro was born about 1530 and lived until 1580. He was married to Chatarina Segna. 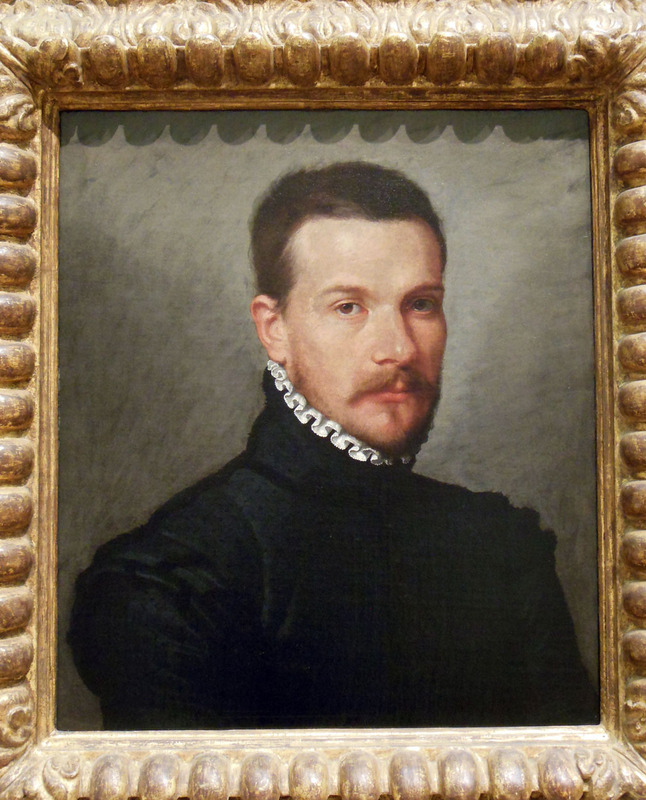 How tempting it is to imagine Pietro dressed as the portrait sitter. Dapper in a ruffled collar, his sandy-colored hair short and beard neatly trimmed, peering at me with steel-gray eyes. Of course, this is all speculation and fantasy on my part. There is no record of Pietro’s appearance. But what fun it is using a little imagination to bring my 10th great-grandfather to life! ← Where in the World Is Louise? Moretto is an important name within a school of painting that flourished in a restricted area in the north of Italy – Brescia and Bergamo. When all the world was collecting paintings representing Greek gods and heroes, local collectors in this area developed a taste for scenes of everyday life, often of the lower classes (see the famous portrait of a taylor by Moroni). Was it just another expression of snobbery? Who knows. These paintings are nowadays re-valued, not just because of their being an important piece of evidence on the look of the lower classes, but also for their intrinsic quality. I have recently seen an exhibiton in Brescia where some works by Moroni were shown, but also by Cerutti “il Pitocchetto” – his Padernello cycle is such an incredible anticipation of XIX cent art. As for the question: did the old Genetti look like this?, I would be cautious. The thing is, Tyrol was special exactly because there was this in-between class of wheathy peasants who were not present elsewhere, and whom the Tyrol dinasty made noble in order to get their support in the attempt to unify the area under their domain. But they were and remained people who worked in the fields. I would say the portait you show, one in which Moroni for once portaied a dignified personality, is more like a member of the Thun family, living in Castelfondo’s castle. But you are right, Louise, the look of our ancenstors is a fascinating topic. Thank you Chiara for the wonderful comment. I was not familiar with the work of Moroni and was very taken with this portrait, especially finding it in an Australian museum. Yes I agree with you, it is highly unlikely that our ancestors were of the same social class portrayed in the painting. A very good observation that it better represented the local nobility of the Thuns. Mille grazie!